To the same bowl add the self raising flower and three medium eggs. I suggest that you beat the eggs separately and then pour them into the mix. I mixed the eggs in a mug before adding them in. It is important to work air into your cake when you mix so mix with a folding techinique or alternatively you could use an electrical whisk like I did. By adding air into your cake it will make it light. At this point your cake could curdle. It is really up to you how much coco powder you use but too much could make your cake too bitter. I suggest you use about a table spoon because this will give your cake a chocolatey flavor and a light brow chocolate colour without making it too bitter. Also I suggest you sift the coco powder to make sure there are no bitter lumps in the cake.Make sure you fold the coco in because you do not want to beat out the air you just put in. I am using 2x20cm round cake tins although it is really up to you which shape or size you decide you want to use. You should always grease your cake tins as this prevents the cake from becoming stuck to the sides of the tin or been burnt around the outside. heat the oven too 180℃ or 350℉, gas mark 4. It is best to allow the oven some time to heat before putting your cakes in. Usually my cakes take between 20 and 30 minutes to cook. The time your cakes take too cook can be different in different ovens. When your cake is ready it should be quite firm but still spongey. You should only open the oven to take the cake out because opening and closing the door causes rushes of air that can cause dips in your cake or for it to become deflated. You will need to give your cakes time to cool before you apply the icing otherwise it will melt into the cake. You can use the time when the cake is cooling to make the icing. You will need to place a pan of water on the stove and wait till it begins to simmer. You then place a bowl of chocolate into the pan of water and this will make the chocolate melt. When the chocolate has started to melt add butter. When the butter has begun to melt add a few table spoons of milk. I then used my electrical mixer to beat in 200g of icing sugar this causes the icing to stiffen. I do not have a hand held whisk although I think that would also work. It is important this proces is done quickly because the chocolate will begin to set. Step 10: Apply the Icing to the Cake. I put the icing straight onto the cake after making because it becomes hard to put on when the chocolate sets.First but a little in the middle to stick the cakes together. I used a pallet knife and spatula to apply the icing because it allows you to smooth the icing and this gives the cake a better finish. I put some Strawberrys on my cake because I used dark chocolate and I needed something sweet to cut through the bitterness. 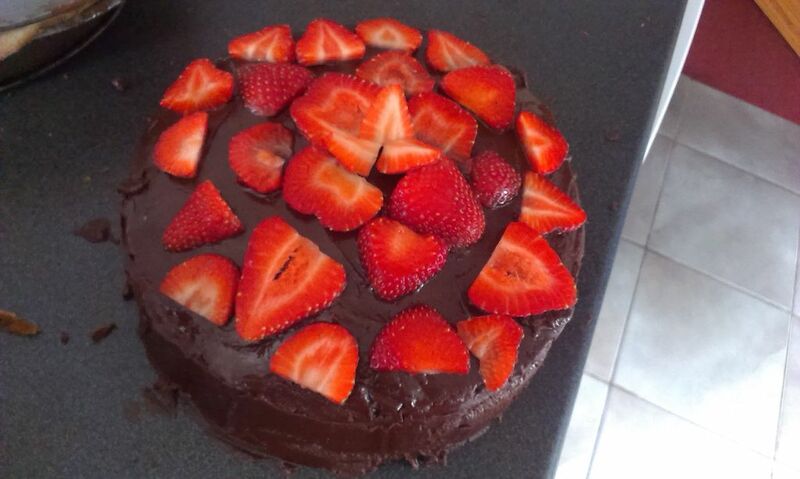 I like the combination of dark chocolate and Strawberrys but I have made this cake using white chocolate for the icing and dark chocolate instead of strawberrys. You can really use any chocolate you choose and put anything on top you wish. I like the way my cake looks home made I didn't really have a good technique for applying the strawberry. I finished my cake with a dusting of icing sugar for a little more sweetness. Oh wow! I want that. :D looks so good!